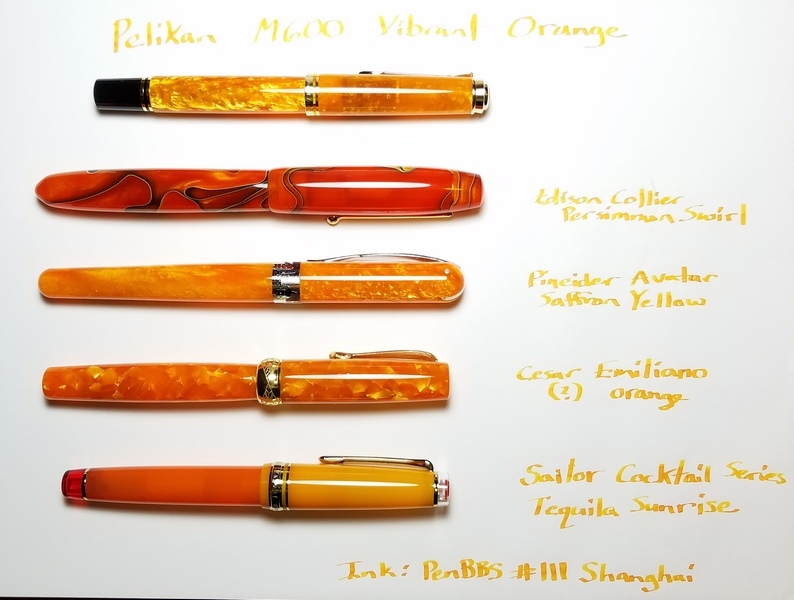 I just got my gorgeous Pelikan M600 Vibrant Orange. 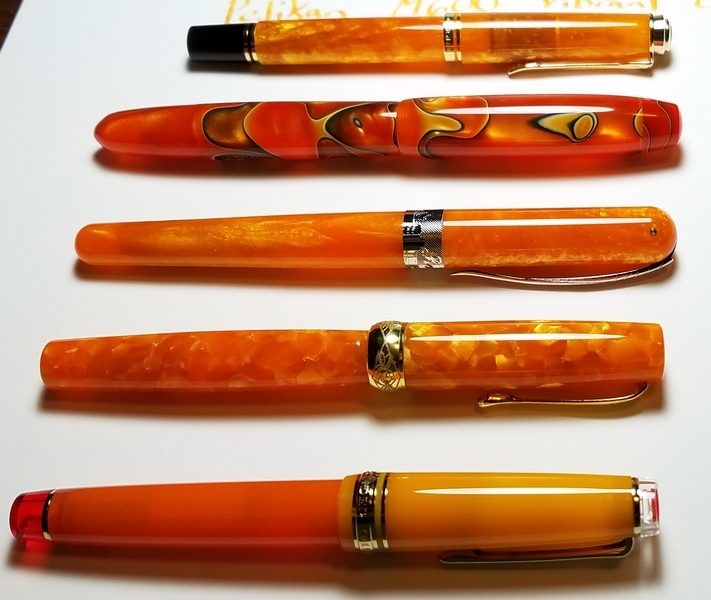 So I decided to take a couple of pictures comparing it with some of my other orange fountain pens. Can you tell I like orange? I'm right there with you! Such a lovely assemblage! This will be very helpful to people who have seen the other pens decide whether this new Pelikan is the right shade for them. On second perusal, the Edison reminds me a bit of my lovely Neponset in Emaralds on the Sun acrylic. Are the dark patches green on that pen? They are dark grey with a bit of a very dark green shading. I think the Emeralds in the Sun acrylic is generally more green. I'm not fond of the Noodler's pens (I had 2, but got rid of them), but I do like the look of that particular acrylic. Grey and orange is also a killer combo! I can confirm that you're right that emeralds on the sun is decidedly green in its dark component. Also that this Noodlers pen is problematic. Had good luck with other pens from Nathan, though! My main line of thought there was origin of material. Seems there's lots of similarity between material the pen makers use. Also seems that such a specialized trade (swirling/bobbing of liquid just so to make a usable blank) would indicate an expert producer supplying the whole market. I've tried to make a blank that has the neat blobby lava lamp quality in resin, and I don't know how they do it! Liked the Cesar and the Edison best. Where were my sunglasses? Beautiful collection, thanks for sharing those pics. I particularly love your Cesar Emiliano. And the Pineider. 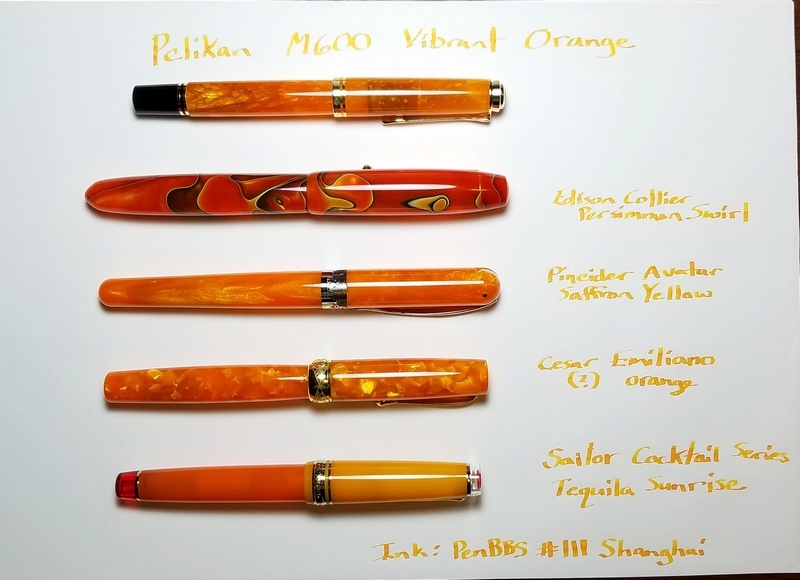 This tipped me over the edge to order the Pelikan. Just can't resist orange. Will line it up with my eye-scorchers here when it arrives. And @bass1193 - Ooh, you are awful!! Yes, you really should have warned us to put our sunglasses on before viewing...REALLY BRIGHT! 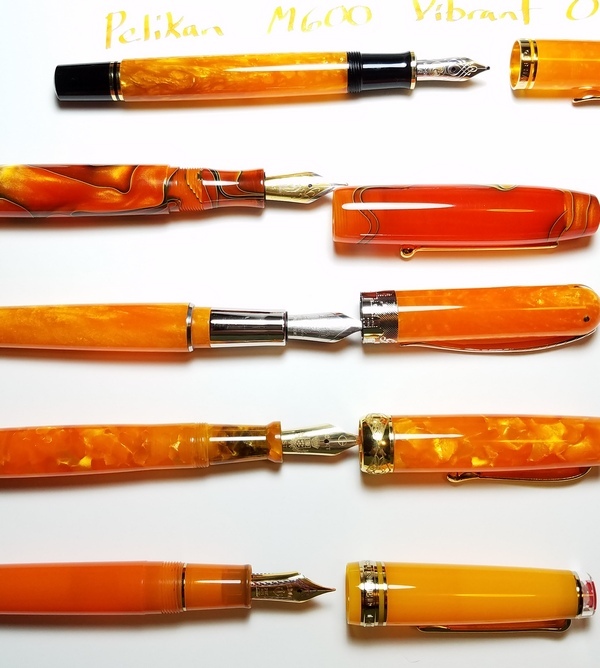 if you don't have a pocket pen, you might consider the new Kaweco Art Sport in it's Pearl Orange acrylic. I find it reminds me of the orange "background" of my Persimmon Swirl. 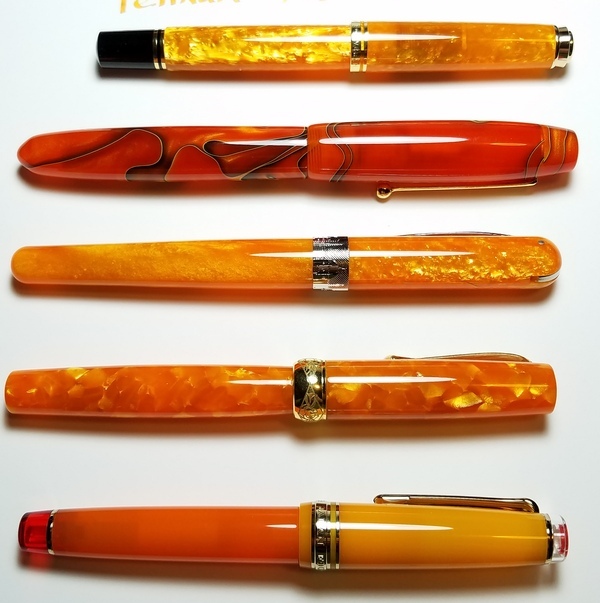 Thanks for sharing your pens; I also have a soft spot for orange, pens, their ink or my car's interior trim, for which I chose orange leather seats & door panels, with dark grey leather seat backs. 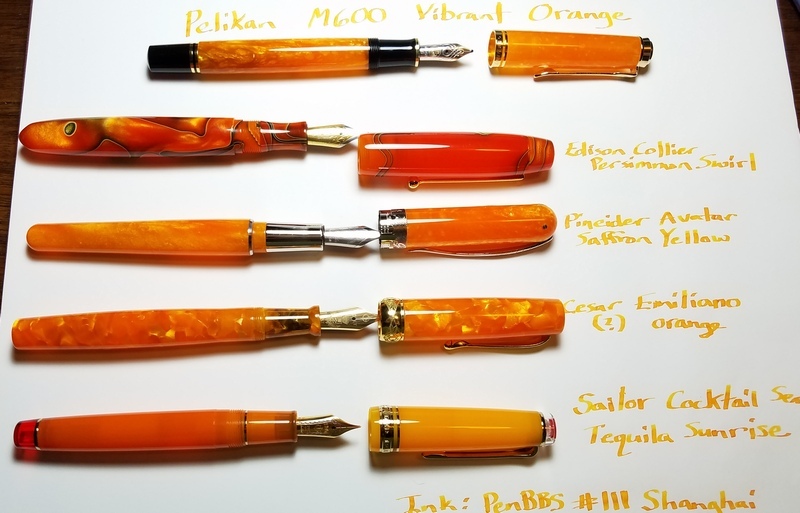 They’re all great looking pens!! I have not failed. Ive just found 10,000 ways that wont work.